Stokesley is an elegant town on the River Leven at the foot of the Cleveland Hills and close to the North York Moors National Park. The wide cobbled High Street, with College Square at one end and West Green at the other, is bounded by Georgian and Regency buildings. Stokesley has a long history and the weekly Friday markets, which are held along the High Street date back to 1223 when the town was first granted a charter to hold fairs. The River Leven runs just behind the main street and is crossed by the Pack Horse Bridge, dating back to the 17th Century and which was once the only crossing into the town. The Mill Wheel, thought to represent the site of a mill recorded in the Doomsday Book is close by. Just off the market place stands the 14th Century church of St. Peter and St. Paul, with woodwork carved by the ‘Mouseman of Kilburn’. 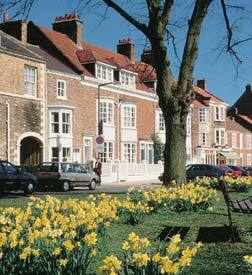 Stokesley holds a major one day agricultural show in September each year. The town is also well situated for exploring the surrounding countryside of the North York Moors National Park and the North Sea coast.